Always on the lookout for a healthy snack or treat, I am always trying out new things. Health Warrior did great in the naming department. With a name like that, it’s hard to turn away from it. Right? It says Health Warrior! The Chia Bar, in its new packaging above, really does a thing or too to help you stay fit this Halloween season and beyond. Instead of handing out sugar-filled treats, which I admit, I am guilty of loving…you could hand out healthy goodies that not only taste great but also keeps the trick-o-treaters healthy. 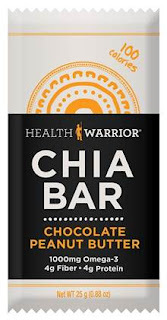 I was sent two boxes of Health Warrior Chia Bars to test out, one in Peanut Butter Chocolate and one in Coconut. They do have a third Acai Berry flavor. So what are Chia bars? I know what comes into my mind when I think Chia…Ch- Ch- Ch- Chia! Remember Chia pets? Do those still exist? But no, that’s not what we’re talking about. Legend has it that the Tarahumara Indians, renowned for their superhuman endurance and incredible fitness levels, as well as the Aztec warriors used the Chia seed. Elite athletes are still using it today. Sign me up for some superhuman strength! These bars are packed with protein, vitamins, minerals, antioxidants, 1000mg of Omega 3’s, and 4g of dietary fiber, yet they only cost you about 100-110 calories. The texture of the bars was a chewy, crunchy melody of chia seeds and flavor. I personally preferred the Coconut because I love all things coconut! I’m not a big fan of peanut butter but still found the peanut butter chocolate palatable. These bars aren’t very big but they do fill you. I was using these as snacks in between meals and one did the trick! The boxes do retail for about $30, meaning each bar is about $2 each, which may seem a bit pricey for many. I’m also not sure whether I experienced an actual boost in energy. I imagine you’d have to be continuously using the Chia seed to see effects. Overall, I enjoyed the taste, convenience and health benefits of the Chia bars. 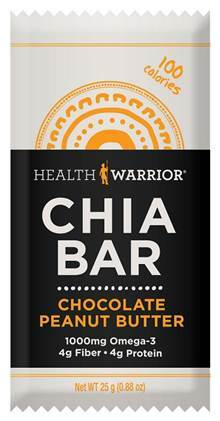 Buy It: Shop online or in stores for Health Warrior Chia Bars. A box of 15 bars retails for $29.99. Coconut and peanut butter both sound good to me! Those look (and sound) so yummy! Chocolate peanut butter is right up my alley! Sounds delicious.